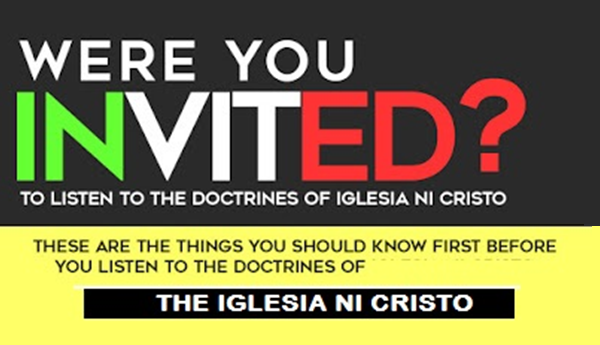 DO you have a relative, classmate or a friend who is a member of the “Iglesia Ni Cristo” (Church Of Christ)? 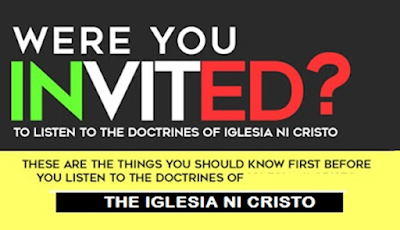 There are a lot of things you need to know about the Iglesia Ni Cristo before you accept their invitation to attend their “pamamahayag” (Bible exposition), “doktrina” (Bible Studies on doctrines) and “pagsamba” (worship services). Thus, we do not give any private interpretation on what the Bible says. Thus, we reject all man-made doctrines. Thus, we don’t give any personal opinion. This is what you will witness in our “pamamahayag” (Bible exposition), “doktrina” (Bible studies on doctrines) and “pagsamba” (worship service”) – the minister asks the question and get the answer STRAIGHT FROM THE BIBLE. So, what will you receive from our Bible studies are the pure and unadulterated words of God.